Pit the mighty Blood Angels Terminators against a lethal swarm of agile Genestealers in this two player board game. 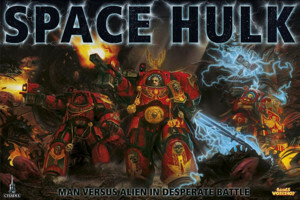 Inside the cramped confines of a derelict Space Hulk known as the Sin of Damnation, the Blood Angels must fight to save Mankind from the alien menace that lies within. The rules to play the game and 16 missions (4 that are brand new) are all contained within two full colour booklets: the Rulebook and Mission Book. There are also 35 plastic Citadel miniatures, including: 11 Blood Angels Space Marine Terminators, 1 Blood Angels Space Marine Librarian in Terminator armour, 22 Genestealers, and 1 Broodlord. Also included are three plastic mission objectives models: a dead Space Marine on throne, a Blood Angels artefact and a Cyber-Altered Task Unit. In addition to the booklets and miniatures, you will receive a set of high-quality card tiles that make up the gaming board. Included are: 110 gaming counters, 77 corridor and room sections, 2 new boarding torpedoes , a brand new turbo-lift, 20 doors with plastic stands, 1 mission status display, a sand timer and 5 dice.